Should you wish to view any of our completed projects, please ask and we will gladly show you some of our work. Thanks Terry for everything, we love our new carpet! Have this morning transferred outstanding monies to your account for job well done. Please pass on my thanks to the three carpet layers. Thank you for quoting for us. You came out as the most professional..
Lovely new carpet, delivered and fitted on the agreed days. Courteous and polite service. Couldn't ask for more. Thank you, we are really happy with our new carpets, and really appreciate you coming back on Saturday to fit the carpet in the cupboard. Thanks for everyone's efforts with the carpet install on Tuesday - the finish looks great! The work looks lovely thank you so much. Very pleased with the work carried out. Most professional at all times. Mrs Diane Byles, Warlingham – November 2017 – Fitting carpet + door bas and showing bottom of door. Excellent job very courteous men, would highly recommend. Very professional, excellent service from start to finish. Excellent choice of flooring and much easier to choose than being bamboozled by pushy sales staff in a big chain store. We had the whole house re-floored by Cherry Carpets, LVT downstairs and carpet upstairs, both of which were fitted superbly. Both times the team were punctual, tidy, polite and did a fantastic job. The carpet fitting team were incredibly quick and the result has transformed our upstairs. They were happy to move some very large furniture and made sure we were pleased with everything before leaving. I'd highly recommend them. Absolutely spotless at all levels. Ms Rosalind Francis - based in Wokingham - 14 February 2017 - Carpets fitted in living room and stairs. We were very impressed with Cherry Carpets. They had a good quality selection of carpets, the price they quoted was very good and they were able to fit the carpets very quickly. The communication with the office was very good - everything was sorted out very efficiently. The quote they gave us was very good, especially compared to the quote we had from a well-known chain of carpet stores. The carpets look and feel great and we know they must have had to sort out some dodgy floorboards under the old carpet which they did as part of the service. Mrs Caroline Hawking - based in Wokingham - 13 February 2017 - Replaced flooring with engineered wood. We had a problematic floor fitted before we moved in and we engaged Cherry Carpets to replace it. The job turned out to be more complicated that we had anticipated and Cherry Carpets were great in their communication with us throughout. We are delighted with the outcome and would recommend them for their professionalism throughout. Ms Chelsea Roche - based in London - 30 January 2017 - Carpet in lounge, hallway and bedroom. Competitive price, fast and convenient service (installed 3 days after home visit). I only marked down timekeeping as our appointment for the home visit wasn't in the the estimator's diary so no one turned up between 8am and 9am as booked. However, when I rang at 9.15am they were very apologetic and someone was with us at 10.20am so it seemed an honest mistake. The end result is great. Flexible with installation date and were able to install while we were on holiday (they sent us pics on completion). Good communication. Would highly recommend. Nicholson Mclaren - based in Wokingham - 2 February 2017 - Laid New Polysafe Flooring. We are very pleased with the quality of work that was on time and within budget. Ms A Jackson based in London - 27 January 2017 - Carpet fitted on large landing area and on some stairs in a big Victorian house. Old carpet removed and disposed of. I am well satisfied with the work done. Paul is an extremely pleasant person. When there was a choice about how the carpet should be fitted (e.g. around large newel posts and on a step which curves round a corner) he consulted me, explaining the options, so that I could choose the one which most appealed to me. He also told me that I should contact him at once if any problems appeared after he had left. There were no problems - everything is fine - but I found it reassuring that he was very willing to return if I was dissatisfied in any way. Miss Hannah based in London - 27 January 2017 - Carpets fitted to bedroom and hallway. From start to finish this was much easier than I could have expected. Very happy with the service. The quote was efficient, and received the day after inspection, and the team arrived very early on Monday morning so they could beat the London traffic and get the work done early. Team of three worked very efficiently together and the end result looks fabulous! Reasonable price and I think better service than one of the carpet right type shop (was not impressed with their advice). Paul did a fantastic job fitting carpet to my stairs. I am very pleased with the workmanship which is of very high quality. Very pleasant people from admin to fitter. Excellent communication. An excellent job completed by fitters. They arrived on time and were courteous and professional. The standard of work was very high and we would not hesitate to use this company again. They worked full days for six consecutive days to ensure the work was completed on time. The fitter for Cherry Carpets an excellent job. I would recommend them to family and friends. Excellent and efficient work carried out. Cherry Carpets thank you. A first class service who helped provided a first class service. A job well done. 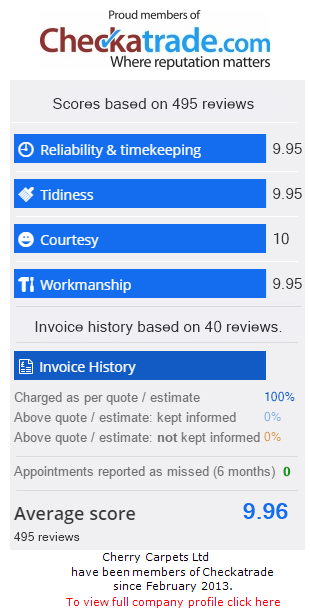 Fitter was excellent - very friendly and did a brilliant job. Highly recommended. Customer in Orpington - December 2016 - Wooden flooring on ground and first floors of house. Carpets on stairs. A thoroughly professional job completed to a high standard by Terry and Mark. They were courteous, helpful and worked long hours to ensure the job was finished. Very pleased with the results, we had four other carpet fitter come round to fit the stair runner but due to the pattern of the carpet and the 3 winder stairs none of them were willing to do it. Cherry carpet fitter came round and did a great job, we are very happy to finally have our Persian stair runner fitted! Thank you so much for your wonderful service, and a huge thanks to the guys who did a brilliant work with the carpet fitting... everything was just pure quality that it brought me to tears! I would definitely recommend your services to family and friends. Just wanted to thank you and your team for a very efficient, helpful and straightforward ‘experience’. The floor looks terrific. The installers mentioned my stair carpet – which was laid at the same time as the hall carpet they removed but which has not suffered from shoes and moths in the same way. I’ve agreed that when I can afford to replace it (with a townhouse, that’s two landings and lots of stairs) I shall certainly ask Cherry Carpets. The carpets we had from you were a great hit with my visitors, my sister and niece who were enthralled with their bedrooms. Thanks for fitting us in before their arrival it really was much appreciated. We really love the floor - the fitter did a great job, especially as it was seemingly in a really bad state. Great service much better than the big firms. Very good customer service, high quality workmanship and high quality product. Great service from quotes to finished fitting. High quality job, cleaned up afterwards, double checked with us all was OK.
Professional job and finish, friendly service, efficient work, very satisfied. Lloyd did a brilliant job on our flooring. Thank you from a happy customer. Great job - thank you! The guys were punctual, efficient and friendly. Finish was very good. Will definitely use Cherry Carpets again. Very happy from start to finish. The measuring was carried out and I was shown a good range of products to choose from with no pressure. Kerry the fitter explained his plane of action for the job to be carried out as soon as he came to our house. The work was done to a very good standard. We are very happy with everything, and our hallway looks exactly how we wanted it to look. Very efficient service. I needed an insurance quote for a replacement laminate floor. Cherry Carpets were the only company prepared to visit the site rather than quote from photos they were approved by my insurer and did a great job. Brilliant job. Lloyd did a brilliant job sorting out our kitchen & bathroom flooring. I would definitely recommend Cherry Carpets. Thanks! I was so pleased with the professionalism I received from your company, I promised to send an email. Sadly, I never had the time as time was no longer there and I had to be at the airport. I was so impressed how having found your company on the internet and never meeting or speaking with you before. It was amazing how you managed to capture the exact carpet we wonted just by me giving a description to you over the phone. You turned up early and made sure we ended with a real professional job. I don’t think anyone would believe that I received such outstanding quality just from a phone call. No one would believe, I was about to travel to care for my father, and we needed the carpet - like yesterday! You surely stepped up to the mark along with your team. Thank you so much for your help during a very stressful time. Mr Stephen Pike, Croydon - December 2015 Carpets in living room and hall. Survey and quote easily organised and in relaxed manner. Work carried out in clean and efficient way - exactly as requested. Invoice and deposit arranged via email with good communication. Thanks to all involved. Mrs Roma Dibua, Bromley - December 2015 - New carpet supply and fitting. Work was completed on the agreed day to a good standard. Kpam, London - December 2015 - Carpet fitted in lobby. To start with, the sales man Rich was a pleasure to do business with and the rest of the company that I dealt with over the phone and in person were all a great help, with every enquiry. The work ethic of Cherry Carpets LTD was 10/10, well recommended. Nice, courteous guys. They worked professionally and left site very clean and tidy. Would recommend. Very happy with the finished result. I pointed out a problem after the initial installation which Charles and his team promptly rectified the next day. Excellent company. I have used them three times now. Recommended. Good clean workman, helpful and workmanship excellent. Would recommend them to my friends and family. Most important took away materials not required. Thank you. Excellent service, quality, delivery and attitude. Fast and excellent work. Would recommend Cherry Carpets to anyone. We will be returning to Cherry Carpets when we choose new carpets for upstairs. Excellent service, will use again and recommend to others. Very professional, clean tidy and a beautiful finish to our rooms. Really excellent, customer focused company, providing quick, efficient service in friendly and professional manner. I am very happy with the quality of the work. I will definitely recommend Cherry Carpet to other people. Professional, clean and tidy, polite. Very efficient and punctual. Good quality product. Tradesmen courteous and on time. Excellent job done. They were very quick. And they didn't mind about using the moth spray. First rate. In additional to supply and fit of carpets throughout the first floor of my house, Cherry agreed to take on replacement of the sub floor, after I was let down by a previous contractor. They dealt with unexpected minor structural works required in a very professional manner, and overall I was delighted with the final result. Good advice, great value and an excellent finish, highly recommend. Excellent service - My laminate kitchen floor was ruined due to a leaking washing machine. I had used this company previously so returned for an insurance quote which was accepted. Communication between Cherry Carpets and myself was excellent. A really personal service. A very rare experience these days! The new floor was laid to a high standard by the experienced fitters. Done a good job and carpets were fitted well, turned up when advised. Cherry Carpets are a professional, reliable organisation and a delight to do business with. Nothing was too much trouble, they were honest and straightforward and they have a huge selection of carpets. They gave us advice about the most durable carpets and carried out the work effortlessly. Cheaper than most other larger companies. Thoroughly recommended! 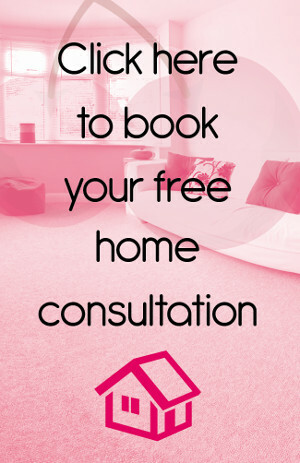 Help to choose the carpet and flooring in the first place, when the time came the carpet and flooring was laid to a high standard by David the carpet fitter, very helpful and friendly and in good humour, a minor problem sorted quickly with no fuss by Cherry Carpets. Happy customer and they used a spray with a 10 year guarantee to protect the carpet, was on 3rd floor no lift so difficult job. I have used Cherry Carpets three times now and every time they came round promptly, gave us clear estimates, did the work fast and well and left everything tidy, invoiced us clearly and were a pleasure to work with. Highly recommended. Fantastic company - always on time, quotes and work. Done quickly and efficiently with a big smile. I can't recommend Cherry Carpets high enough. Cherry Carpets provided a great service at very competitive prices, will be recommending them to my family and friends. Very pleased with the quality of work and competitive price. Excellent workmanship, good attention to detail, possibly was there slightly longer than originally anticipated. Will be using Cherry’s services in the future. The guys arrived on time as agreed which was great. Very friendly and polite! I found the work efficient and tidy, no mess left behind and the furniture was put back where found which made things a lot easier as I wouldn't be able to move some of the items by myself. Great job and good quality carpets! Would definitely recommend. Carpeting the upper floor of our 4 bedroom house. We needed the carpet fitted at short notice and Terry of Cherry Carpets was very helpful and obliging. They did an excellent job and cleared up after themselves. We would recommend them to anyone. Supplied and laid carpet to first floor of town house. I tried 5 different companies but this was the only one who could match existing carpet, source it and lay within one working week. This really helped me out. Communication was good. They kept me informed at every stage; the quality of the carpet was as requested. They were quick workers, friendly but professional. I can't comment on how their prices compared with others as I didn't have the time for careful competitive pricing, but I wasn't after cheap and cheerful anyway! A job well done. Full carpet replacement throughout 2 bed flat. Terry was very polite and helpful. He assisted with sending through pictures or additional information to make sure we made the right decision. Work completed on time to a high standard. Helpful with moving furniture in/out of rooms too. Retail store fit. Cherry Carpets Ltd were asked to help out with a retail store installation and fit out in London's Westfield Shopping centre. Terry was helpful and knowledgeable and provided a great service throughout. I will definitely be relying on his services further. Carpeting of upstairs rooms and stairs. Very competitive price and they fitted in the job at short notice, working a bank holiday. Friendly service and happy over all with the work done. Recommended. Laying of new carpets. Cherry carpets were excellent. Would thoroughly recommend them for their care and attention and punctuality as well as keeping me informed at all stages of the work. If you want to get a carpet laid, get a Cherry Carpet Ltd laid! Carpet laid. Quotes were given and then samples sent to allow us to seriously reduce our costs by matching a patch of existing carpet. Very impressive communication and flexible approach. Would highly recommend them for advice before and during the fitting. Great workmanship and friendly service. Carpets laid throughout two bed flat. Very helpful and courteous and work completed on time, to a high standard. Would highly recommend. Thank you. Re carpeting my whole flat. Very pleased with the standard and quality of work done. My flat looks much improved now the new carpet has been laid. They kept everything tidy and cleaned up at the end too. New carpets for two bedrooms. Excellent service. Good choice of carpets, very pleasant lads who were prompt and efficient. Carpets laid in two rooms. Very good job done-really handy to not have to go to a showroom. Will definitely use again and would recommend. Carpet fitted in 2 rooms. Fantastic to deal with, extremely professional to deal with, all costs detailed and explained. I could not be happier with the result. Would recommend them highly to everyone. Old carpet and underlay taken up and new underlay and carpet put down in 2 changing rooms hall and stairs. Very good workmanship, very pleased with them. Will recommend to others. Refit of carpets following installation of wardrobes Excellent service, will use again. 2 classrooms fitted plywood and carpets I would recommend this company. Office and spare room carpeted I would recommend this company. He is really good. Bedrooms and stairs carpeted I would recommend this company. Bedrooms and stairs carpeted He is very good. One room in her shop Bias I would recommend this company. 3 rooms and hallway carpeted Trustworthy, more than happy to recommend him. If you are interested in carpets, carpet tiles or floors of any type then please call us on 020 8249 9726 or click here to complete the contact form and we will be in contact within 24 hours.